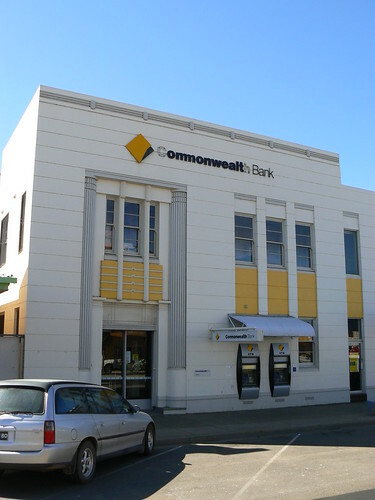 In New South Wales, during the Depression, the Government Savings Bank was amalgamated with the Commonwealth Bank. For Leeton, in rural NSW, this meant that their 1921 Government Savings Bank by Sydney architects Ross & Rowe became a branch of the Commonwealth Bank. 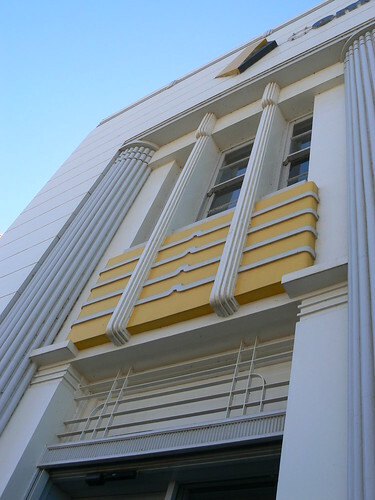 That was in December 1931 and by the end of the decade the new owners had made some alterations in Art Deco style. There have been more changes since then it remains a very stylish building. I like the way they've applied their branding to the building without ruining the design of it. Good point Hutch. There are so many bad examples of re-badging buildings without any thought of the style of the building. That goes for the installation of air conditioners and other modern alterations. Those columns look very elegant and classical for a small bank in a small rural town. Or did the Commonwealth add them on, once they took over? The columns are great and I suspect the Commonwealth added them as part of their makeover. I've found a picture in the State Library of NSW of the Government Savings Bank in Leeton from the 20s. If it's the same building the CBA made significant changes.